Like many young bloggers, Shaza Essam uses her personal Web site to list her favorite Hollywood movies, talk about a popular song and complain about her studies. But some of the postings by the 21-year-old dentistry student in Cairo are far less typical. In an entry about her childhood ambitions, among becoming a doctor, a photographer or an actress, she adds, "I dreamed that I was one of the mujahideen in Chechnya or Palestine, and that I was blowing myself up among as many enemies as possible so that I could be like the martyrs." A photo of Abdou el-Monem Mahmoud on his blog. Ms. Essam is one of a growing number of young members and supporters of the Muslim Brotherhood, a fundamentalist Islamic group in Egypt, who have joined the blogosphere in recent months. The Brotherhood, which officially renounced violence in the 1970s -- though group leaders endorse "armed resistance" in lands they consider occupied -- says it wants an Islamic state through peaceful means that respects the rights of minorities. The Brotherhood has branches outside Egypt and spawned the militant Palestinian group Hamas. 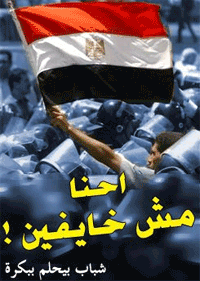 In Egypt, it is a growing force and constitutes the largest political opposition group. But some of its views and activities remain highly controversial. Banned by the Egyptian government, the group has long used Web sites that promote its ideology and provide its leaders with a platform. But, until recently, online windows into the personal lives of individual members have been rare. The new blogs by young Brotherhood members often mix political views and diary-like reveries, capturing the attempts of some to reconcile free expression and adherence to strict doctrine, and the tensions that can result. Ms. Essam, a conservative Muslim who wears a veil, started her Arabic-language blog, molotoofy.blogspot.com, in February. She says she picked the name, which roughly translates as "My tongue is a Molotov [cocktail]," because "my words are the only thing I can use to resist any injustice and express my opinion. Also, I am usually blunt without meaning to be; my words may come out like bombs when I am talking to a friend." Topics range from her political views -- she admires Ahmed Yassin, the late spiritual leader of Hamas -- to her entertainment picks -- the Will Smith movie "Men in Black," for instance. Unlike many Brotherhood members, she keeps her affiliation a secret at her university, for fear of harassment by authorities. But she has gradually begun giving the blog address to trusted colleagues. "When these people get to read about my likes and dislikes, they will know that I am an ordinary person just like them," she says. Across the Middle East, Islamic groups with varying backgrounds -- including al-Qaeda -- have used the Internet to advance their causes. Political blogs have also become a tool for activists challenging their governments and clamoring for democracy. Muslim Brotherhood members are increasingly starting blogs as the Egyptian government has stepped up its efforts against the group, arresting many members and freezing the assets of some. The crackdown further intensified after a December protest in which around 50 students who belong to the Brotherhood appeared in military-style black uniforms and balaclavas. That prompted accusations that the group is establishing a military wing, which it denies. The Muslim Brotherhood distances itself from groups like al-Qaeda and condemns their attacks. It runs charities and social services that help make it popular among many Egyptians. But critics charge that the group's strict hierarchy and opaque way of operating are at odds with stated democratic aims and that its conservative views would preclude freedoms, especially for women. The new blogs by Brotherhood members are laden with political messages, largely adopting the organization's views and campaigning for the release of jailed members. A few refer to acts of violence, such as one that posts the will of a Palestinian suicide bomber. Mixed with the political messages are favorite songs, diary entries and vignettes on personal relationships -- some from well-known junior figures in the movement and others from relative unknowns, such as Ms. Essam. Magdy Saad, a 29-year-old who works in marketing and is an active member of the Brotherhood, described in his blog how he anxiously awaited a response from the family of a girl whose hand he had asked in marriage. Two days later, he broke the news: He was turned down. "God, I accept your decision," he wrote. Readers responded with sympathy: "God willing, He'll give you someone even better," wrote one. He has received support but also criticism from some Brotherhood members for blogging about personal details and thoughts. "The Egyptian society is conservative and has many areas that are out of bounds when it comes to personal affairs," he said in an interview. "The Brotherhood has more of these out-of-bounds areas because there's a great emphasis on the moral side, so some people think that talking about this human and personal side runs contrary to morals." Abdou el-Monem Mahmoud, a journalist and a well-known member of the Brotherhood, was one of the first to start his own Web site. The site (ana-ikhwan.blogspot.com) says it has received more than 239,000 hits since it started in October. Mr. Mahmoud, 27, posts messages from the families of jailed group members and describes how their imprisonment is affecting their children. "Aisha started screaming: 'Father, father, can you see me?' She yelled and cried when she saw her father but wasn't able to kiss him," he wrote on Feb. 25. "These scenes have really left me exhausted." The latest entries on the blog are not by Mr. Mahmoud, but by others giving updates on his own jailing. Mr. Mahmoud was arrested last Sunday, accused of belonging to the banned Brotherhood and of inciting students to stage a military-style parade, according to Abd el-Monem Abd el-Maqsud, a Brotherhood member and the group's lawyer. Mr. Abd el-Maqsud says no such parade was held. The Paris-based Reporters Without Borders, a nonprofit group that defends press freedom, this week called for Mr. Mahmoud's release, accusing the Egyptian government of "increasingly repressive policies toward online dissent." Julien Pain, head of the press group's Internet Freedom desk, said that in addition to a crackdown on the Brotherhood, the arrest is "also a way to tell other bloggers that from now on they should be careful." Egyptian authorities wouldn't immediately comment. Young Brotherhood bloggers say the effort is grassroots, and some even see it as a potential catalyst for change within the organization. "Our life is not all about arrests and politics...We eat, drink, get married, sleep...laugh and joke," Asmaa el-Erian, daughter of one of the Brotherhood's prominent members, wrote on her blog. But some critics believe that blogging is part of a coordinated strategy by the Brotherhood to project a modern image and widen its support beyond its traditional base. "They're trying to seize the imagination of the young and see this as an area that shouldn't be just left for the liberal forces," says Amr el-Choubaki, an expert on Islamic groups at Cairo's Al-Ahram Center for Political and Strategic Studies. "It's part of the group's strategy to infiltrate the different institutions of society." Even if the blogs were introduced by grassroots members, "the leaders up high at least didn't object," Mr. el-Choubaki says. جزاك الله خير التقرير فعلا رائع .. وبجد جزبنى وكلام أستاذ مجدى سعد جميل اوى ..إن شاء الله يكون فتح خير على الإسلام والمسلمين . ما شاء الله..ايس بس يا شوزى اللى على على يا ستى..